A summary of the grading scale described below. Crisp Uncirculated = No folds, no problems. Complete and square margins/borders. Uncirculated = No folds. No problems. Border may be cut into the margin but not into the design. May be uneven excess border areas as well. AU = 1 cross-body fold. A corner fold or 2 may be tolerated as well. XF = 3 cross-body folds. A corner (even wide) fold or 2 may be tolerated. VF = No more than 8 cross-body folds. The note will have good body and crispness by definition. Circulation wrinkling counts as folds. F = The note is complete and the design and lettering clear and strong. The note retains some body. VG = The note is complete but may have edge splits. The design is readable. No body remains. Limp. G = The note is nearly complete (less than 3% may be missing). The design is well worn and parts are weak. AG = No more than 10% missing. 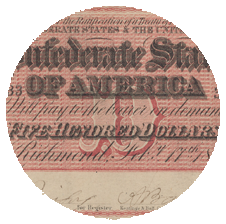 Market-Oriented Grading – Used by many (not all) dealers and some collectors. Also fairly typical of eBay grading (which actually can be more liberal than market-oriented grading)? Market-oriented grading is designed to maximize revenue of the seller. It generally plays to the best features of a note, downplaying a note’s weakness. For example, a limp technical VG with good color and cut may be called F or even F+. A note with a lot of wrinkling due to handing in addition to many folds, but has strong crispness may be called VF, though it is technically Fine due to circulation to a strict grader. This style of grading will tend to push notes up the grading scale anywhere from 1/2 to 1 1/2 grade, though it also may yield the same grade as collector-oriented grading in some cases. As it is oriented to the market, the definition of these grades may change over time. In particular, in slower periods, old market-oriented VFs become Fines and close to collector-oriented grading. Of course, this can result in substantial financial pain for the owners of notes purchased with market-oriented grading assumptions. This style of grading is also known as “commercial” grading. Collector-Oriented Grading – Used by some dealers and most serious collectors. Collector-oriented grading is designed to differentiate notes, especially at the high end, so collectors get a clear picture of the note holistically. This type of grading maximizes value for the buyer, even taking into account higher prices paid for a note of a given grade label vs. market-oriented grading. It also forms the basis for a true condition census due to its strong differentiation at the high end. This style of grading will tend to drive notes down the grading scale as problems are taken into account and the note is graded as a whole. This style of grading will stand the test of time. Owners of notes that used this style of grading are unlikely to experience grading deflation. The grade shouldn’t change with the market…the prices do. Let’s look at another area of numismatics for an example. 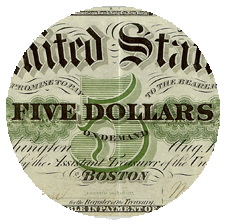 American Numismatic Association and the commercial grading services scales have ebbed and flowed up and down over the years and are viewed by early American copper collectors as commercial or market-oriented grading. EAC grading which is essentially 1940s-style grading modernized has withstood the test of time much better and is an example of collector-oriented grading. CSA Quotes assumes collector-oriented grading. If you or a prospective seller is using market-oriented grading, you must make adjustments as described above to the scale described below. Failing to do so will be hazardous to your financial health! It is possible to have a good relationship with a dealer or collector that uses market-oriented grading. Just don’t argue about grading with them, remember what style they use and adjust in your mind each potential purchase before buying. There will always be some difference of opinion, at least in some cases, due to taste as grading remains a subjective endeavor. Typically, these differences of opinion are not greater than 1/2 of a grade if both parties are using the same style of grading. Finally, no one is perfect and all of us make mistakes or miss things on a note. Poor: Severely worn and damaged. May have more than 25% of the note missing. Fair: Filler. Severely worn. 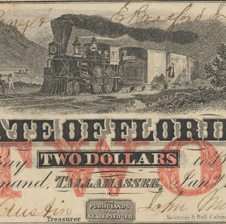 Part of the note may be missing; e.g., no more than 25% and that may be crudely repaired with backing. About Good: Heavily worn. Up to 10% of the note may be missing, but no more. May be crudely repaired. Earlier generations called this “Fair”. Good: Heavily worn but intact or reasonably repaired with backing or archiver’s tape. May have edge splits and some tears not readily visible and obvious into the note. G-VG: Can’t quite make VG due to problems or excessive wear. Very Good: Heavily worn and intact. It may have heavy creases and will have lots of wrinkling from handling. Only relatively minor stains, edge splits and holes are permitted without net grade deduction. No crispness left – a limp note. Considered average circulated. Fine: Worn but has at least some body or crispness left. It will have more than 8 folds and perhaps a good deal of wrinkling from circulation. Must deduct at least a half of grade for anything but minor stains and edge splits. A ½ grade deduction may be from a single tear that is not large and readily visible. Significant repairs and tears cost at least a whole grade and may drive the note towards SCUDZY depending on severity and visibility. F-VF: Typical “commercial” VF or VF-XF found at many tables at a show. Too much wrinkling, too many folds (more than 8), or the folds are too heavy to be called VF, but a nice note and better than Fine. Very Fine: Obviously circulated, but not significantly so. Vertical and/or horizontal folds will be present, but will not be heavy. Some will use the benchmark that no more than 8 folds may be present. This note has a significant amount of body or crispness left. Little circulation wrinkling readily visible to the naked eye can be tolerated at this grade level – each wrinkle counts as a fold. Many Fine or Fine to Very Fine notes are called Very Fine in today’s (2002-3) hot market. Beware. Minor holes, tears, edge splits and repairs cost about ½ of a grade. Any single thing that stands out as a problem cost a whole grade. Anything more significant than a 1 grade deduction will drive the note to SCUDZY at the lower grade level. Choice VF: VF note with great trim and/or color. May be worth as much as many VF-XF and even some XFs. VF-XF: A couple more folds than can be tolerated for XF. No circulation wrinkling visible. Extra Fine (XF): Very lightly circulated and nearly all of the crispness retained. Will have 3 light folds across the body of the note as seen on the typically blank reverse. May have a subtle corner fold or 2 as well. Any minor problem or repair on the note will cost ½ of a grade. A couple of minor repairs (no more than 0.25 inches) will cost 1 grade. Bad trim (into the design) will discount the note ½ of a grade or more if particularly severe into the design. Anything readily visible and obvious will cost a whole grade or more. XF notes cannot have significant problems to speak of. Very subtle variations in color due to aging or trivial staining are OK if not noticeable. Choice XF: XF with exceptional color and/or trim. Better than AU in eye appeal and usually worth more. This is not the same as XF+ or XF-AU which has 2 folds and perhaps a corner fold. About Uncirculated: Old XF. A corner fold. A single fold across the body. Counting handling that is readily discernable. An obvious smudge. Bad trim on an Unc note which cuts obviously into the design. Any one of these make a note AU. More than a couple drives the note to XF+ or XF. These are typically called Unc by many, especially on the Internet. A trivial repair (less than 1/8 inches) will cost ½ grade. A minor repair or 2 that are not distracting will cost a whole grade. More obvious tears, repairs and problems can quickly drive an AU note to VF and SCUDZY. Choice AU: Better than Unc and worth more. May be a CU note with a minor circulation issue described under AU. “Gem” AU notes may be worth more than some CU notes. Uncirculated: No circulation or problems. OK cut, may cut into the margin, but not a lot. Many of these are called “CU”, but are not. Choice Uncirculated are notes with exceptional color and eye appeal, but may have a minor trim issue. Can’t quite make CU on trim. Worth more than Unc and some CU notes depending on taste and “Wow!” effect. Crisp Uncirculated (CU): Unc but with good trim. Cannot be cut into the margin lines and must be quite straight. Choice CU: CU with excellent trim and exceptional color. The table above lists the grades and general descriptions about the CIRCULATION of the note. PROBLEMS (with the exception of cut cancellations) REDUCE the net grade. Many CSA notes have been cut-cancelled or cut-out-cancelled to indicate that they were paid and collected by the government. This is different than damage or repairs and these notes deserve their own pricing. These notes, especially clean cut-cancels, are attractive and desirable in their own right. Some varieties are extremely difficult if not impossible to get not cancelled. In general, cut-cancelled notes command a price of 2/3 that of an equivalent uncut note. While cut-out-cancels vary, on balance they are worth about 1/3 that of an equivalent uncut note. Some varieties with cut cancellation will be worth a bit more than these ratios. Some more common types perhaps a bit less. There are those who say that clean cut-cancellations with no paper loss have little effect on value. My experience leads me to believe this is not true. I’ve not seen a cut-cancelled CSA note bring a similar price as an uncut example of the same note in the same grade in the past couple of years. I’ve also never been able to sell cut-cancelled notes for the same price as un-cut examples to the people who postulate that there is little difference in value. It may have been true in 1996 at Criswell’s 1996 prices, but it is not true today. Therefore, I use reasonable estimates in CSA Quotes based on real sales for cut and cut-out cancelled notes. I will change this when I find someone(s) who will by my cut-cancelled type notes at un-cut prices. NOTE: Some rare varieties are only available cut (or a cut cancelled example may be the only available for decades) and this guideline may not apply to R9 and better notes the same way it does for type examples. This is a reflection of the real world of currency trading. How can one determine the value of an “VF” 1861 T-22 CR-151 with the current price guides? Generally, notes fall into one of three categories: Oh Wow!, That’s Nice, and Yuk! Of course, there are those in between as well, but for the most part, that sums it up for any given grade level. The prices listed above may seem high, but they are not. Many T-22s offered as “VF” are really Fines or maybe F-VF. Double check whether market or collector grading is being used and adjust accordingly. An “Oh Wow!” note can be considered CHOICE. CHOICE means one or several things: Exceptionally clean surfaces and color (free from marks and stains), or a great cut on an attractive note. Color is important in that it must be attractive; No washed notes here. Also, there cannot be any significant distractions on the note. The more pleasing the note, above and beyond normal, (i.e. clean surfaces, cut and color) the more likely the note will command a “runaway” price. CHOICE in CSAQ refers to a note that is exceptionally clean with nice color or cut with no more than average handling for the grade (preferably less). A note that has impeccable surfaces, cut and gorgeous color may be worth more than CHOICE. CHOICE notes may be worth more than average notes of a higher grade. Condition is as important as technical grade! AVERAGE in CSAQ refers to an original note that has typical handling for the grade. A high grade XF or better piece has few distractions, a VG piece can have more. A washed and /or pressed note that is attractive can fall into AVERAGE. SCUDZY represents varying degrees of “Yuk!”. Note that these notes are collectable, and do have value, just not as much as AVERAGE or CHOICE. A note with some repair or damage will be worth more than SCUDZY, but certainly not AVERAGE. A SCUDZY note may be harshly washed and restored such that the color is badly worn; or has significant and obvious repair and/or damage. SCUDZY notes may also be original, but have problems like tears, missing pieces or edge problems that detract from the note. A minor problem or two is not cause enough for a note to be SCUDZY, however, anything that really detracts will put it in the SCUDZY category. Usually a note with more than one grade level of reduction due to problems is SCUDZY. Problems detract from the grade to determine net grade and price. This type of grading represents a godsend to those who are concerned about quality and paying and getting fair prices for notes. On the other hand, this additional layer of grading may seem excessive to some. Some may not like it! What are the motivations of those who criticize it? Perhaps it can be improved and they have a good idea. Or are they selling or buying? If so, what side of the equation is their argument vs. what they are trying to do?!? It reflects the real world. 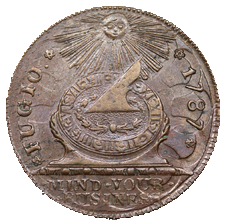 And has decades of use in numismatics at least in a couple of segments. Think about it. PCGS and PMG are using some form of market grading standards except for Uncirculated notes where they are very strict in terms of no folds are present even at the microscopic level. PCGS published their standards and generally stick to them. PMG does as well and has improved their consistency since the publication of our 2008 book. PCGS and PMG graded notes can be worth a bit more than uncertified market graded notes, but probably will not meet traditional grading standards, particularly in the Fine to Extremely Fine range. PCGS and PMG are generally conservative for AU and Uncirculated notes. PMG and PCGS are not consistent with the use of Choice and condition described above using it to mean a split grade rather than eye appeal. Choice Uncirculated/New may not have full frame lines at Unc/New 63 and sometimes Unc/New 64 grades. Most other third-party grading paper money companies use liberal market-oriented standards or in some cases, less. PCGS and PMG do a respectable job putting a floor on quality within a grade range and have become proficient in detecting repairs (though occasionally they miss something, or see something that is not there, as we all can). Notes housed in Net or Apparent holders have a wide range of quality from very nice (in rare cases may be nearly choice) to dogs with major problems, so each need to be evaluated on their own. However, PMG and PCGS focus on technical grading due to circulation and damage and do not have a mechanism for evaluating condition or eye appeal – whether a note is average, better than average, choice or gem for the grade based on its color, trim and margins. The exception to this are slabbed notes of New or Uncirculated grades to some degree. This is important as Very Fine, Extremely Fine or AU notes can have a wide range of values depending on these factors not reflected in the slab grade. 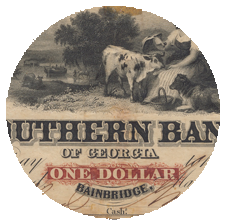 A fully framed Confederate or obsolete note is worth considerably to a lot more than one that is trimmed into the margin for the same grade. Likewise, color is important. These factors can affect the value of a note by 50%, 2-1 or even 3-1, e.g., an AU 58 (PPQ or not) T-20 1861 $20 CSA note trimmed into the margin is worth between $150 and $300. The same grade, AU 58 (PPQ or not), with a full frame and good color/inking is worth something like $500 to $1000 depending on eye appeal. I will continue to use the terms plus for above average, choice and gem to mean varying degrees of superiority of condition and eye appeal of a note within a grade as documented in my book which is based on what collectors seek out and pay premiums for. 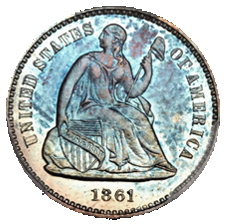 In coins, we’ve seen the third-party graders add things like full bell lines, full head, full bands which reflected the market. I’d expect either the grading services or another party to do the same for paper money. If you are just buying the number on the holder for the best price, you may well be buying low end notes for the grade!